All Web addresses mentioned were functional as of 12-30-15. From the Cumberland Gap to the Atlantic Ocean, this is Virginia Water Radio for the week of January 4, 2016. Every year, at noon on the second Wednesday of January, the convening gavels sound at the Virginia General Assembly, calling to order 100 members of the House of Delegates and 40 members of the State Senate. Those 140 legislators typically consider 2000 to 3000 bills and resolutions, including the Commonwealth’s budget. Usually between 100 and 200 General Assembly bills each year have something to do with water or with land uses that can affect water. What topics, do you think, are or ought to be on the General Assembly’s water agenda? Have a listen for about 10 seconds to one possible list, and see if your choices are there. Those and other important water issues often get some General Assembly attention. But, of course, the Assembly has a lot more on its mind than just water. Taxes, health care, education, transportation, and other big issues challenge legislators’ time, energy, and negotiating skills. Whatever the topic of legislation, however, state legislators are always focused on what groups of constituents might be affected. Have another listen for about 10 seconds to a list of some of the constituents the General Assembly must consider. Lots of topics, lots of constituents – plus, the sessions move fast and the decisions can have widespread and important consequences. Those are the legislators’ challenges. But Virginian citizens have a big challenge, too: following the work of their elected representatives and voicing their opinions. Citizens can follow legislation and find contact information for General Assembly members online at virginiageneralassembly.gov. 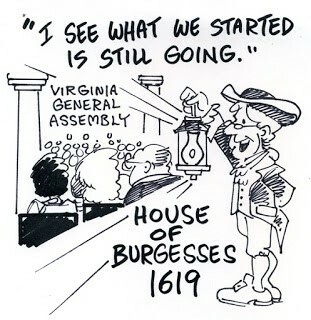 By participating, citizens add their voice to the long history of debate in Virginia’s legislature, which began in 1619 as the House of Burgesses. Thanks to several Virginia Tech colleagues for lending their voices to this episode. And we close with a few seconds of a tune that may have entertained Virginia legislators as far back as the 1600s: “Greensleeves,” performed here by Timothy Seaman of Williamsburg. MUSIC – ~ 13 sec. The voices in this episode were recorded in October 2015 at Virginia Tech. Thanks to those colleagues who participated. The performance heard in this episode of the traditional tune “Greensleeves,” from the 1998 album “Celebration of Centuries,” is copyright by Timothy Seaman and Pine Wind Music. More information about Mr. Seaman’s music is available online http://timothyseaman.com/. Illustration by George Wills, Blacksburg, Va., http://www.etsy.com/people/BlacksburgArt. Virginia General Assembly Web site, at http://virginiageneralassembly.gov/. Wisconsin Historical Society’s American Journeys Web site, “Proceedings of the Virginia Assembly, 1619,” online at http://www.americanjourneys.org/aj-080/index.asp. ES.11 – the atmosphere, including human influences on climate. BIO.8 – dynamic equilibria and interactions within populations, communities, and ecosystems; including effects of natural events and human activities.